This article is about the Event in the Nintendo 3DS version of Mario & Sonic at the Rio 2016 Olympic Games. For other uses of the term "100m", see 100m (disambiguation). Info Keep tapping the A Button to speed up! The flames turn red at top speed! Compete to reach the finish line fastest on a 100m track. 100m is an Event that appears in the Nintendo 3DS version of Mario & Sonic at the Rio 2016 Olympic Games. The objective of the event is to run the 100m track in the fastest time, with the starting world record being 9.580 and the starting Olympic Record being 9.360. The playable characters in this event are Mario, Yoshi, Nabbit, Sonic, Shadow, Metal Sonic and Mii, with Nabbit being unlocked by beating him in 100m Plus on the first day of Sonic's story in the Road to Rio mode. Toads appear as referees in this event. In the Road to Rio mode, 100m appears as the event on day 1 of Sonic's story. In this event, the player starts by charging up their character by pressing and holding when "Ready?" is displayed onscreen, and starts the race by releasing it once "Go!" appears. 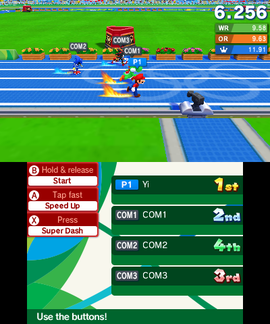 The longer the player holds the button, for the more speed the character will start the race with. The player can also perform a Rocket Start by releasing at the exact same time as when "Go!" appears, giving them a large speed boost to start the race. Once the event has started, the player must quickly press to cause their character to accelerate. Their speed is indicated by the color and type of trail following the character, with white smoke indicating a low speed, blue flames indicating a moderate on and red flames indicating the fastest. The player can also press to perform a Super Dash, which can only be performed once during a race and causes the character to quickly accelerate to maximum speed, indicated by the word "Max" appearing on their trail. Release the B Button in perfect time with the start signal to get a Rocket Start. Lean forward while performing a Super Dash to get an even faster time. This page was last edited on February 26, 2019, at 18:55.